The little known Maungaharakeikei Falls (pronounced Mong-ah-hah-rah-kay-kay)are probably the North Island of New Zealand‘s least known major falls and yet it is clearly seen from a minor State Highway, if one knows where to look. Touted as the 2nd longest drop falls in the N.I. at approx. 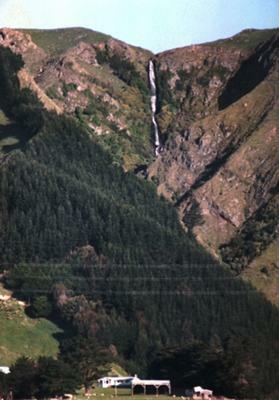 100m, the falls discharge from the steep face of a ridge that form the foothills of the Tararua Ranges about 20 km south of the city of Palmerston North. Situated on private land they can be seen most clearly after recent rain from out on the Manawatu plains from the west south-west of the falls (a jutting ridge covered in pine trees blocks the view from the north).Only a small catchment area feeds the falls so they can look very barren during the summer.